Hi all! 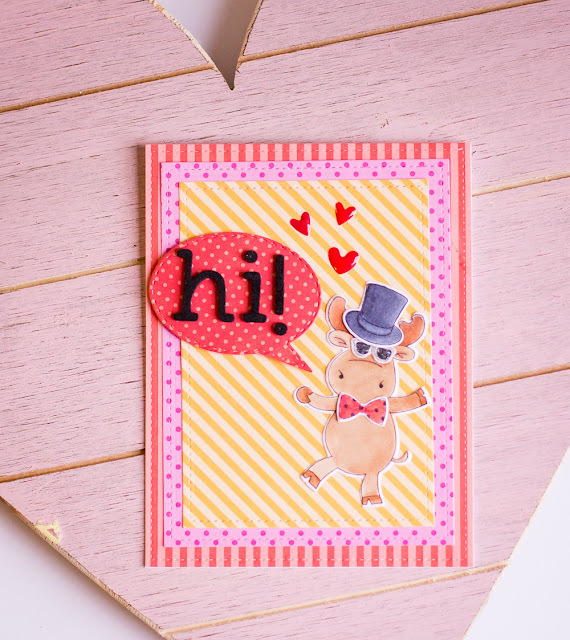 This is my first blog hop as a design team member with the CardMaker Design team! 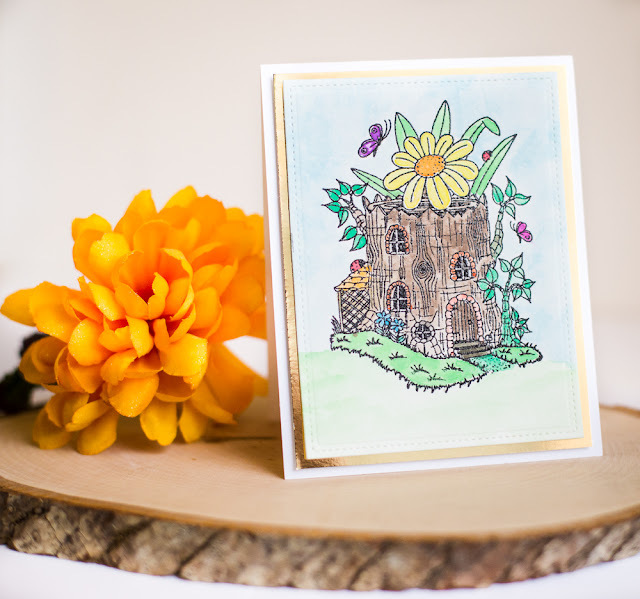 The CardMaker Blog team has joined up with the stamp and die company Riley and Company to give you lots of inspiration using their products. First, I used the Tree Stump House stamp. I heat embossed the image on water color paper and then easily colored in all the little spots with a water brush and watercolor cakes. Next I used a combination of Red Rubber Basic Stamps, Riley Dress Up Stamps and Dies. I colored my stamped images with Copic markers and then die cut or fussy cut them out. 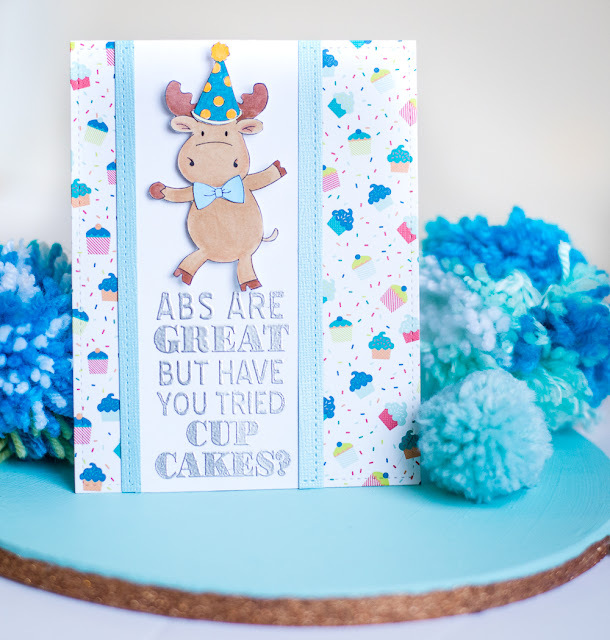 On this first card I combined them with the Abs are Great stamp to make a birthday card. And on this one I combined them with the Word Bubbles Die Set to make a hello card. The Riley and Company stamps and dies were so much fun to play with! Check them out for sure! But first hop on over to Katie Skiff's blog! If you ever get lost along the way, just head on back to the CardMaker blog because they will have the whole list! These are great!! Love your coloring on the lil house. That has to be my favorite Mushroom Lane image right now!! Wonderful line up of cards, Rebecca! Very cute. I like your coloring on the first card. Darling cards- the Riley images/sentiments are so cute- and funny! Cute Cards--I love all of them! Love the decorator paper word bubble. So cute! Love your Abs are Great card with the Dress Up Riley.. Thanks for playing along. Great projects! I think my favorite is the cupcake one. Beautiful set of cards, Rebecca! Absolutely LOVE your cupcake card! What great cards you created! I love that extra mile you went on the photography as well. Thanks, for sharing.